Afars and the Issas was a French Territory between 1967 and 1977. Prior to this the area was know as French Somaliland (Côte française des Somalis) and after 1977 as Djibouti. It had a total land area of around 9,000 square miles and had a population of around 200,000 as of 1974. 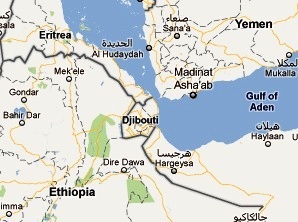 The area is in the Horn of Africa bordered by Eritrea, Ethiopia, Somalia, Red Sea, and the Gulf of Aden. French Administration was first established in the area in the city of Djibouti in 1894 following various treaties with the Sultans between 1883 and 1887. The first stamps of the French Territory of Afars and Issas were a set of five stamps issued on 1967 showing Fauna. The set (Scott #310 to #314) catalogs for around $50 MNH and around $50 Used. The designs show Grey-headed Kingfisher, Eurasian Oystercatcher, Common Greenshank, Abyssinian Roller, and Unstriped Ground Squirrel. An Air Post stamp in the same theme issued on August 21, 1967 (Scott #C50) showing Tawny Eagle completes the set. That stamp is sought after and catalogs for around $20 MNH and around $15 Used. A set of four stamps issued on May 17, 1967 showing Buildings. The set (Scott #318 to #321) catalogs for around $6 MNH and around $4 Used. The designs show Damerdjog Fortress, and Administrative Buildings at Ali Adde, Dorra, and Assamo. A sister-set of ten stamps was also released in the 1968 to 1970 timeframe. That set (Scott #324 to #333) catalogs for around $25 MNH and around $17 Used. The designs show significant buildings in Djibouti: Justice Building , Camber of Deputies, Great Mosque, Monument of Free French Forces, Djibouti Post Office, High Commission Palace, Residence of Gov. Leonce Lagarde at Obock, Djibouti Harbor-master’s building, and the Control Tower at Djibouti Airport. A set of three stamps issued on February 22, 1974 showing a pictorial of Flamingos with Lake Abbe in the background. The multicolored set catalogs for around $12 MNH and around one-fourth that for Used. A few sets released between 1975 and 1977 showing Fauna. The sets include the Sea Shells Set (Scott #382 to #391) that catalogs for around $40 MNH and around $15 Used, the Butterflies Set (Scott #392 to #399) that catalogs for around $50 MNH and around half that for Used, and the Fauna Set (Scott #400 to #407) that catalogs for around $30 MNH and around one-third that for Used. Another set of Sea Shells stamps released in 1977 (Scott #433 to #436) is also sought after, cataloging in the $20 range for MNH and around $5 for Used. The first coins of Afars and Issas were French Colony Decimal Coinage (100 Centimes = 1 Franc) Aluminum Francs issued in 1969. The coin (KM# 16) has a mintage of 100,000 and catalogs for around $6 in UNC. A few other issues in denominations from One Franc to a Hundred Francs using Aluminum-Bronze, Copper-Nickel, etc alloys were also issued during the period till 1975. The higher denominations catalog in the $15 range in UNC. The issues have mintages well into the 100,000s. Essais from the 1968 to 1970 timeframe (KM #E1 to #E7) have low mintage (1700) but remarkably catalogs only for a slight premium over regular issues.